It’s great to predict sleepers for the draft and all but I feel predicting busts can be just as beneficial to owners. Especially to new fantasy football players who only know names and not the injury history or even mental history of certain individuals. These busts all have issues of some sort, so don’t reach early for them. Let some other schmo be disappointed mid-season. He’s going to be a first rounder in almost every league this year, with good reason but he could so easily be a bust. The way he plays is just reckless and will most certainly miss a few games because of it. Don’t get me wrong, it will be amazing to own him while he’s on the field but don’t be shocked if he goes down in week 2 with a broken collarbone. I really hope he doesn’t have a bad year, but this is a prediction and really good, steady running backs are hard to find. It was one year. Can he have another successful year? Sure he can. But am I drafting him in the top 5, no I’m not. I absolutely love this guy but I don’t think he can reproduce what he did last year. Man, is there a lot of hype for a guy that just got out of prison or what? Granted he was one of the biggest red zone threats in the NFL a couple years ago but that was a couple years ago. I would take a chance on him late in drafts, but I think his ADP (average draft position) in leagues is going to be absurd. Can’t wait to do my first draft just to see if I’m correct. Kid should be better than Michael Jenkins eventually, just don’t expect it this year. Some will reach because they like taking chances on unproven rookies, rookie WR are the hardest position to pick. Look where Arrellious Benn was going last year? And then look where his fellow rookie teammate Mike Williams was going? See what I mean. Take a chance but do it late! I think Finley will be instrumental for the Pack, but I just don’t think he will do it game-in game-out. His end of year stats will be fine but the consistency might not be. So definitely draft him, just don’t expect Witten/Clark like catch totals every game. Ranked at #6 on ESPN is just a bit high in my opinion. As much as I like Jay Cutler, he tends to put his defense in some tough spots. I also don’t think the young linebackers are ready to take Tommie Harris’ spot just yet. I believe they fall out of the top 10 this year. 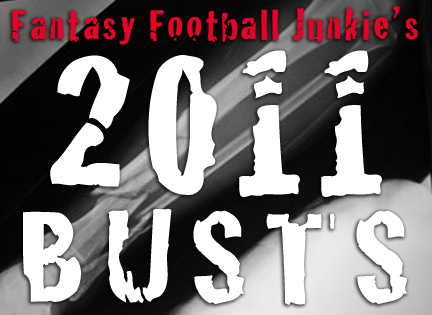 Got any other thoughts on busts for 2011, or do you think I flipped my lid on some of my predictions? Either way, drop me a message and lets discuss!